platform: 500 € + VAT | rack: 1500 € + VAT. 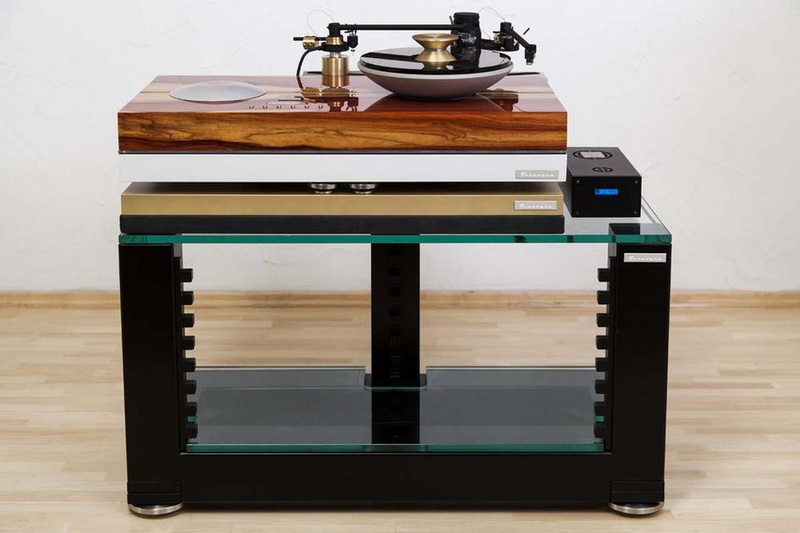 t's style over substance" - I thought, seeing the Tentogra Oscar turntable for the first time. It was during the Audio Video Show 2017.. "It's probably style over substance" - I said to a friend when I saw the same turntable a year later at the Audio Video Show 2018. The change was subtle, because "probably" does not make a summer. Do you remember the scene of a dam being blown up from the Force 10 from Navarone (directed by Guy Hamilton, 1978)? A small explosive charge apparently did not make a dent on the huge structure. It just "scratched" it. The rest, however, was done by nature. I think it was the same with me and the Tentogra Oscar turntable from Ksawerowa. After the initial shock, quickly, when I learned where its form came from, when I listened to how it was built and when it finally spent some time in my system, its shape became familiar and more natural to me. The construction of the Tentogra turntable was my idee fixe. I wanted to pay tribute to both music that would achieve the best possible reproduction and setting, and an architect who is an incomparable master for me. I wanted to combine my two first and longest-lasting loves. The master he mentioned is Oscar Niemeyer, and the tribute is the form of a turntable named after him. Although Oscar Niemeyer (1907-2012) is no longer with us, he still belongs to the world's leading contemporary architects. His most important projects include buildings in Brasilia, the new capital of Brazil, from the 1957-1964, the Cathedral of Our Lady of Aparecida, or the Seat of the French Communist Party. Another of his achievements is the National Congress building located at the Plaza of the Three Powers. Please take a look at this building and you will better understand where I am today, and the form of the turntable we are talking about will become understandable and even natural as if it were the only possible one. Of course it is an illusion, turntables have quite specific acceptable shape and form. However, the Oscar turntable expands this pool and for me it will always be one possible ones, next to such extraordinary designs as the Preambulator by Metaxas & Sins, Kronos Sparta, or La Luce, a designed prepared by the Spotheim. 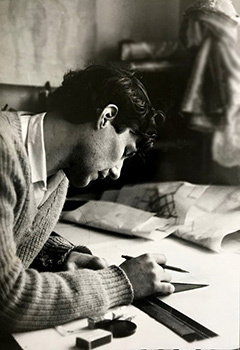 Mr. Wojciech Samołyk, a young student working on his project. My adventure with turntables started while I was still fascinated with the CD in 1999 when with my friend, also an architect, I tried to build a turntable. It never got out of the designing stage, we never even tried to actually build one. Over the period of the next 16 years, I built a large collection of audio devices from the 1960s and 70s. 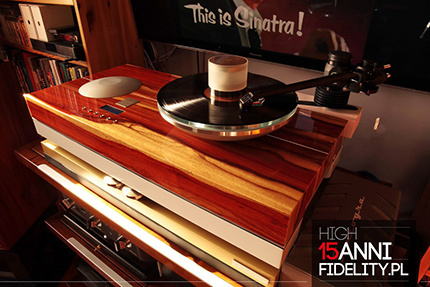 The concept of building a turntable has matured over the years. I studied designs of many old turntables. As an advanced audiophile, I also owned some interesting modern designs, such as the SME 20/2, J. Sikora, Transrotor and others. When I tried to convince my friend to work with me to build turntables together, he refused. Finally, four years ago, I dared to try to design my first turntable by myself. I was encouraged to do that by Mr Jerzy Owsiak - the man behind The Great Orchestra of Christmas Charity (W.O.Ś.P.) and I promised to build and offer him the very first unit. The VERY FIRST unit with the 0001 serial number, or the prototype will be delivered to him this year and it will definitely be auctioned on one of W.O.Ś.P charity auctions in 2020. Let me invite everyone to bid high for it. In 1984, I graduated in architecture at the Lodz University of Technology. 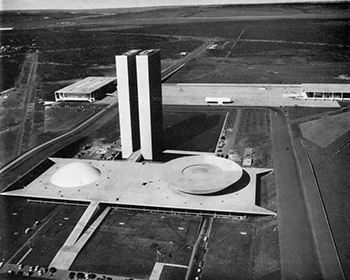 I remember the very beginning of my studies and the enormous aesthetic experience when I first saw pictures of Oscar Niemeyer's projects. It was HIM, not Corbusier, Frank Lloyd Wright, Mies van der Rohe or any other famous architects of the twentieth century, who was my master and guide. The first pictures I saw in architectural magazines, as it turns out today, were photographs of the Oscar Niemeyer's life's work, the new capital of Brazil. The Brazilian National Congress was a very special object for me. The poetry and simplicity of the forms that make up this beautiful object, the contrast preservation principle, the soft/hard lines, the two inverted twin forms that reminded me some convex/concave vessels. At some point when I saw this object in aerial photographs, I understood that the layout of forms created by Niemeyer was also a turntable! I decided to pay tribute to my master by realizing his famous work as "Tribute to Oscar Niemeyer" in the form of a Tentogra Oscar turntable. Please note, that this object made its way to the UNESCO's world's architectural heritage lists, which puts it on a par with the Cheops pyramid. After graduation, I never took a job as an architect. The times were extremely unfavorable for this profession. Today, by entrusting my company to my children, I finally have a lot of time to return to my profession. Maybe not as architect but as a designer. The development of the turntable lasted over a year. I designed all the elements myself using a graphic software. I had to create a functional object, maintaining the basic principles of ergonomics. An important ingredient of the visual features of the Tentogra Oscar turntable was the use of wood, aluminum and using synergy of colors and textures. 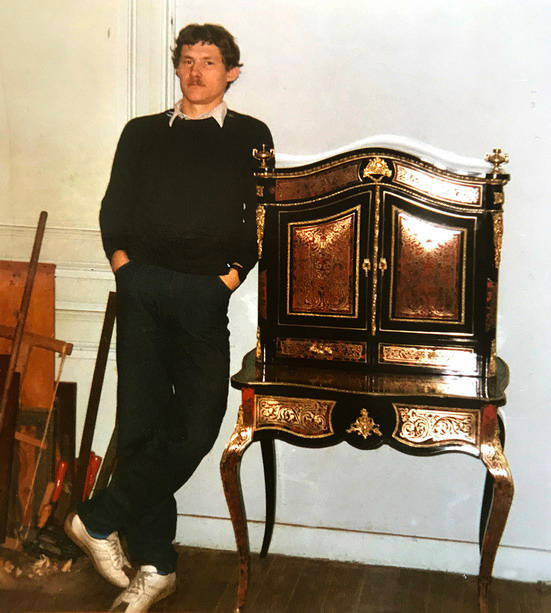 At the beginning of the 1980s, I traveled to France several times and worked there in the reconstruction and restoration of antique furniture under the direction of Jan Czepiel, former director of the Krakow Conservation of Monuments Laboratory (PKZ). When manually applying varnish, I began to understand the beauty of high gloss finish for wood. Restored furniture often came from the 16th and 18th centuries. I transferred these experiences and skills to the chassis of the "Oscar". I decided to make it from stable MDF, finish with exotic wood veneers and colors also other elements. My friend and my daughter's drawing and painting teacher, Mr. Mariusz Korczak, from the Art Education Workshop in Łódź proved to be helpful in this respect. It's hard to believe by I managed to persuade Mr Mariusz so that for 1.5 years I could study with him a completely different type of drawing and painting than those I was taught in college. It was an amazing visual and spiritual experience. The internal construction of the turntable consists of two aluminum slates. Two adjustable tonearm bases are mounted on one of them, a brush-less DC motor and its controller enclosed in a Faraday cage (the convexity on the left side of the turntable) are placed in the other one. The platter features its second invisible part in the form of a pulley inside the chassis and weighs approx. 15 kg. During the Audio Video Show 2018, I presented the second model of the Tentogra turntables, named Gramy. In both turntables I use innovative software that records time of usage for cartridges. We were the first in the world to use this solution. For Oscar, an innovative battery drive is a standard feature. For Gramy it's an option that may be ordered additionally. 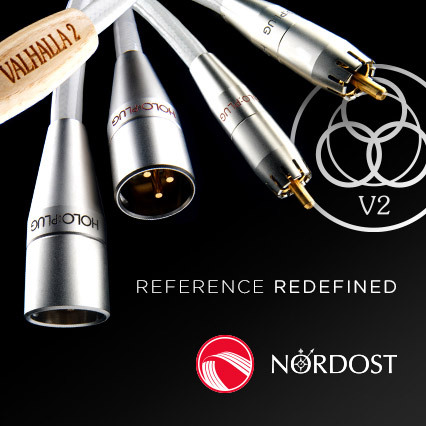 Gramy features yet another innovative solution that allows user to adjust VTA of a tonearm. This feature means that one does not have to use some expensive tonearm to be able to use this function. 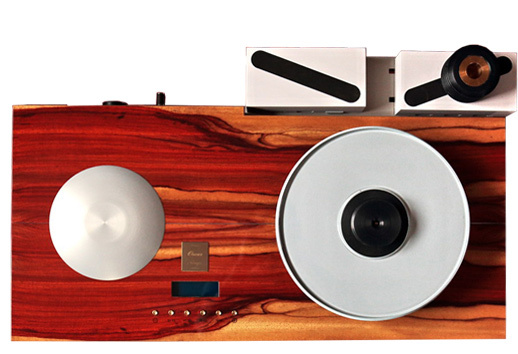 What I find interesting in designing turntables is their evolution or continuous development. Creating values that will make these conceptually very old, devices, easier to use and simply more modern. When I run out of ideas, same as Tesla designers, I ask others for help. In the evolution of my turntables I want to use the latest achievements not only technological ones, but also of fine arts and intuition as well. For now, I plan the third model, and there is another one planned for future. The Plaza of the Three Powers, where the Congressional Palace is located, looks best at night observed from a distance. The building consists of two twin towers, on one side a dome, on the other a saucer. Illuminated after dark, they resemble a city of the future or a scenery of science fiction movies. Certainly, they no one looking at them will think about the seat of the congress and senate. A calm surface of water reflects and duplicates the building. Deck | A sturdy chassis is the first thing that strikes you – it is a non-suspended, mass-loader. It has a form of a long, flat cuboid, visually divided into two parts. The lower part is made on CNC machines of aluminum plates, and the upper part is made of MDF boards. Aluminum is de-stressed - deprived of mechanical tensions - and painted. It is not anodized because the anode introduces stress. The upper part can be varnished or finished with natural veneer. It consists of two halves, closing the chamber underneath, in which elements that can not be seen from outside are hidden. Platter | And you can not see, for example, the rest of the platter. One of the doubts I had when looking at the turntable for the first time concerned mass distribution. 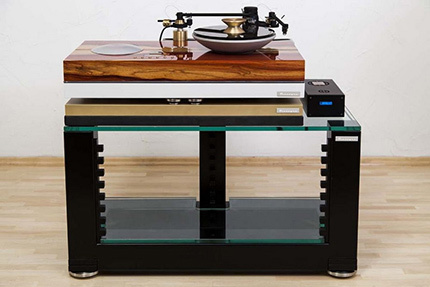 It is a common knowledge that the mass of a turntable should be focused as low as possible. In the reviewed turntable, the visible part of the platter has the shape of a basin tapering towards the bottom. Mr Wojtek, however, removed the housing for me and I could see that there the remaining part of the platter with a large flywheel under it - the center of gravity sits therefore really low, lower than the support point of the bearing.